This paper reviews the role of career guidance and counseling at schools across the globe. The aim of this paper is to overview the career guidance in schools through literature review in order to have perspective of this field, and it further tries to find orientation solutions to rural Vietnamese contexts. Developing social economic in rural areas by moving from agricultural field to industrial aspects, the suitable solution by enhancing quality of education in career value based on students interests, abilities and passion, with more students to switch over to vocational education for their future career opportunities. It will not only decrease the number of undergraduate’s unemployment rate, as indicated by the statement, “excess of higher education degrees but lack of skilled workers” but also provide enough skilled workers for several projects ventured by foreign companies in rural Vietnam. This paper explores the existing literature and analyzes various works done on the importance of establishing career guidance at schools and finds that Vietnam is still deprived of the true spirit of career guidance and lack of vigorous research. While comparing the context of Vietnam with other countries, it may be inferred that career guidance has not yet been paid proper and adequate attention; hence career guidance has not yielded the desired objectives. The current study recommends that willing and motivated staff should be recruited and be given professional training and special courses so that the desired goals and objectives may be achieved. Because the key differences between guidance systems in different countries are related to experiences of economic development, to political system, to social and cultural factors, to education and training system, and to professional and organizational structures. Recently, an emerged issue in labor resources of employment in Vietnam informed of some relevant workshops usually expresses with the short term of “excess of higher education degrees but lack of skilled workers”. According to MS Pham TH, the Minister of Labor- wounded soldier and Social Affairs in Vietnam, there have been 174 thousands unemployed undergraduates by 2014, representing 16.8% of the total number of unemployed. This number compared to 147 thousand in 2014. Especially, the unemployment rate of young workers (aged from15 to 24) is now 7.02% or 543,820 people, accounting for 43.9% of the total number of unemployed. According to Ho Ba, a member in Studies Institution in Vietnam, while employers in new industry areas pay attention to those who graduate from Vocational education or trained for recruitment and the rate of this group job is always getting higher than others. This issue has raised a big question in the career guidance works in schools where students make decisions based on their interests, abilities and passion, while considering their current and future career opportunities. This has led to hot controversial topics with differing opinions related to the career guidance work in Vietnamese schools. While an educational expert said that “high rate of unemployment undergraduates caused from their mistakes in making decision of career of students and their parents” another opinion indicated that “Currently the reports on the jobs information had not been communicated to the students from the schools. Especially, in the rural or mountains lack of magazines, the internet how they know the needs of the job market in present and future”. Besides that a student argued that, “Please do not blame our parents, or our students like us. My parents are farmers working hard on farms how they can know what direction to select for a good career”. As far the career guidance in schools, teachers usually talk in general, they are neither clear nor give any detail on it. In the absence of clear and detail counseling, it is unlikely to choose the right career for future job market demands. There is a common perception among most of the parents according to general social psychology in Vietnam and Asia that getting enrolled their children at colleges and universities is the only way leading to wealth and success. For most of the families in Vietnam have either one or two children. Hence, it can be seen that education and career guidance in Vietnamese schools are facing many challenges and obstacles while a great number of unemployed undergraduates are increasing unabated for want of skills. With technological advances, new career opportunities are created rapidly, the jobs of today did not exist ten years ago and our students will need to be equipped to manage a similar if not more complex future. The average student of today can expect to change jobs several times, often in completely different sectors. They must experience a further period of learning to update their skills on a lifelong basis. Therefore, career guidance in Vietnamese schools need to improve the quality of future career by bringing innovation directed towards substantive development, based on the trend of enhancing perspective career development from theories to value, attitude and practical action . The aim of this paper is to overview the career guidance in schools through literature review in order to have perspective of this field, and further tries to find orientation solutions to rural Vietnamese contexts. Because the key differences between guidance systems in different countries are related to experiences of economic development, to political system, to social and cultural factors, to education and training system, and to professional and organizational structures. Therefore, the perspective overview can find a suitable solution to Vietnam. According to Watts and Fretwell , Career guidance and orientation services have been defined as services intended to assist individuals, of any age and at any point throughout their lives so as to make educational, training and occupational choices and to manage their careers. They include three main elements: (1) Career information, (2) Career counseling, and (3) Career education. Career guidance in schools usually focuses on career information that provides information on courses, occupations and career paths; it also includes labor market information. The aim of Career counseling in schools is to hold a one-to-one interview or in small groups, distinctive career issue faced by individuals such as career in education, as part of educational curriculum, and attention is paid to help groups of individuals to develop their competence to manage their career development. The role of Career Guidance is not only limited to education process but also effecting the national social and economic development. According to Watts, formal Career guidance services are derived from economic and social development which plays crucial role in helping education systems and labor-market work in coordination in order to realize their goals successfully. Generally, the aim of Career Guidance is to help students make decisions based on their interests, passion and abilities, while taking into account current and future career opportunities. Students are encouraged to learn more about the world of work across different industries so that they may take right steps to obtain their objective and goals/aspirations . Another perspective indicated that Career guidance can be referred to as services and activities intended to assist individuals, of any age and at any point throughout their lives, to make educational, training and occupational choices and to manage their career. “Career guidance,” denotes systematic programs that facilitate individual career development and career management. As erst, while discussed in this paper that career guidance renders services and activities that are geared towards helping individuals of any age at any point throughout their lives to make their educational training and occupational choices in order to manage their career OECD. As rightly pointed out by Herr and Cramer, (1996), career guidance offers systematic program that facilitates individual career development and career management. There is more to career guidance than mere face to face interview: SCAGES- (standing conference of association for guidance in education settings UK 1992), SCAGES recognized 11 activities of career guidance such as informing students about the current and future opportunities of job market advising, assessing, teaching, enabling, advocating, networking, giving feedback, managing and innovation or systems change. Yet another important role of career guidance in schools is to prepare students for the world of work by equipping them with the right kind of skills so that they may stay relevant and fit in the world economy while leading a purposeful life. As revealed by research that education in corroboration with career guidance have positive impact on the students’ academic performance and well-being for they help them make good decisions regarding their education career. Education and career guidance set out the following goals, to (1) foster students’ self-awareness, self-directedness as well as skills to determine workable goals, and to learn consistently in order to value-add to their future workplace; (2) assist students to explore and make decisions based on valid information towards their education and career oriented directions. (3) Instill in their minds the value of utility for all sort careers and how all these contribute towards the smooth and well-functioning of society; and fourthly, equipping students with the skills and means, so by means of which they may be able to positively engage their parents and other career influencers . It has been highlighted by some researches that career guidance has greatly contributed towards national educational and labor market policy goals in terms of raising people’s interest in education, training as well as boosting their participation in formal and informal learning, which has positive effects on overall learning outcomes such as equipping them with better decision-making skills and making them well aware of learning opportunities as well. In addition, it has increased job exploration and search activities among people to seek jobs, and thus proved helpful in reducing unemployment by informing them to improve their qualification to seek new kinds of jobs in different areas. In short, American research proposes that providing comprehensive guidance services to students at schools can have a positive impact on the quality of students’ educational and professional decisions, and also on their educational performance and the overall climate of the school. As far learning of goals, career guidance is important for it supports lifelong learning (for both youth and adults) and the development of human resources to support national and individual economic growth and supporting a more flexible education and training system, and strengthening linkages between education/training systems and the labor market. Many countries across the globe acknowledge the value and importance of career guidance for it effectively supports education systems and establishes good curriculum, and enhances quality human resources for this field as well. Yet another important hallmark of career guidance is about the social equity. In some countries, such as Finland, Germany and Norway, it is believed that career guidance is important because it supports the social integration of migrants and ethnic minorities by bringing harmony between them. It can support the integration of the disadvantaged and the poorly qualified and in employment it can address the growing polarization in the labor market, support rising female labor force participation and address gender segregation in the labor market . Educational qualification and employment are important determinants of social mobility: access to them is a key indicator of social equity. Career guidance is not only limited to provide information on jobs and guides students in their decisions but it also helps the youth in selecting their skills needed for developing and executing their long-term goals as a fundamental element of human capital. Career guidance effect on active approaches to assisting unemployed people requiring individual action plans to be constructed that involve job search, education and training, stressing the ability to find and keep a job, and the personal capacity to adapt to a changing labor market and new job requirements. Career management skills appear to play an important role in the formation and use of human capital and in the development of employability . Education career guidance in Singapore based on appropriate activities for students from primary to post-secondary school levels. The model shows education and career development as a process that takes place over one’s life the developmental model. 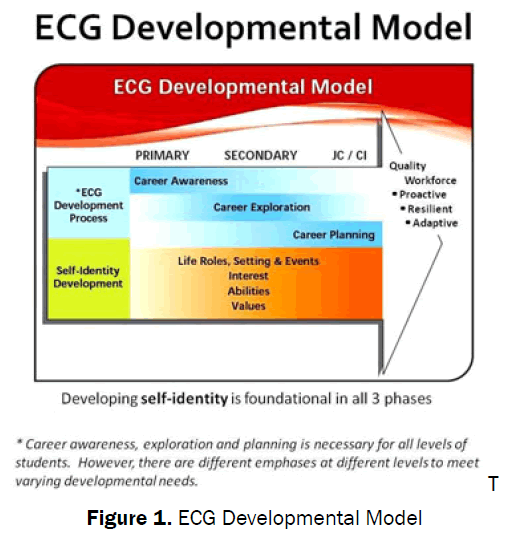 It is a framework that guides schools in coming up with developmentally span with three progressive phases: Career Awareness, Career Exploration and Career Planning as shown in Figure 1. The process of discovering one’s identity involves clarification of interests and values, understanding one’s strengths, developing abilities, and formulating life roles in the context of one’s life experiences. All these work towards building social emotional competencies that help students become proactive, resilient and adaptable. Research by Perry, Liu and Pabian, shows that when students see that there is a relevance between their studies and future career aspirations, they tend to exhibits more involvement and motivation in school. The ECG lessons will provide students with opportunities to explore and investigate various industries, jobs and possible further education options and enable them to see relevance between their studies and aspirations. This will heighten learning motivation and engagement. In secondary school, the phase of education guidance career is to deepen students understanding of self and relate schooling to different education and career pathways as shown in Figure 2. Students would 1) explore the career world; 2) understand the relevant courses of study; 3) develop awareness of their skills, interests and values. The curriculum of career guidance in Singapore is divided in several main themes, include of 1) Self-Awareness and Self-Management; 2) Awareness of Relational Support and Decision Influencers; 3) Exploring the Education Landscape and Planning Pathways; 4) Career Sectors Exploration. And deliver the career guidance approach in both of individual, group, and all students [4,6]. The importance of career guidance can be gauged from the fact that it was introduced in Malaysian schools as far back as 1939. In Malaysia, career guidance was set up in the school system. It is reported that career guidance was initiated in this country as far back as 1939. This acknowledgment is documented in the Report on Vocational Education, 1938 which highlighted the essential of guidance services in schools. Maintaining that guidance services are important in schools, the following years (till the commencement of the Counselors Act 1998) saw guidance services including career counseling becoming as helping services in the educational system. Even though career guidance was introduced as early as 1939, however, its launching in schools only took place in 1967. In 1967, a circular was published which proposed that every primary and secondary school should appoint a guidance teacher, who should do about 25 periods of classroom teaching per week (as against the usual 30 or so) and should be exempted from extra-curricular duties. His role was defined mainly in terms of careers guidance, though he was also expected to interview pupils on personality and behavioral problems, to visit pupils' homes if and when necessary, to be responsible for the environmental health conditions of the school, and where possible to organize Parent-Teacher Associations. In Malaysia, School career counselors playing important role by preparing students to successfully transit to the next level, whether for further education or a job. School counselors to provide career development interventions in new paradigm which not only focuses on a career decision making, but also assisting them in gaining necessary employability and self-management skills. They help students who are unable to access and gain market-driven occupational proficiencies, retrieve, and disperse information through technology as well as to make sure students remain motivated and self-directed. vCareer development is a continuous process involving personal experiences in various aspects of life influencing one’s career over his lifespan. Career development intervention should assist the students to cope with different and diverse roles and preparing them for the futuristic challenges through career education, coaching and counseling . Previously, different strategies have been adopted to study the career choice and development. Yet, the experiences from the career guidance in Malaysia can be summarized into four major points. The first point is the guidance to be paid in the initial teacher training. Secondly, the provision of guidance in primary schools – an American experience based approach. Third, is the provision of guidance through careers clubs that arranges debates, talks and searches for occupational information and finally, through encouraging self-employment. A “committee-based “system has been evolved since 1980’s in schools. These include the guidance committees, disciplinary committees, life-education committees and community services committees. The main goal of establishing such committees was to prepare students for learning, employment and life through comprehensive and balanced learning and experience in these academic settings. These objectives were believed to be attainable by providing students with more work-related experiences . Teachers are the most important human resources in pastoral care and teaching. However, if necessary supportive factors are lacking they may face emotional and physical stress. The number of lessons they are relieved from teaching responsibilities is very limited, probably no more than 2-3 lessons per week. The most common practice in secondary schools is that teachers are expected to be a member of at least two or more committees together with their role as class teachers. While other school teachers are unwilling to be involved in such committees because of the complexity of career information and lack of interest or concern. Presently, Career Guidance Services (CGS) Section of Education Bureau provides supports to the schools and developed different assessment tools. In addition to the CGS, local mass media are keen in providing career information to the students and their parents near the release of public examination results [9,10]. The Japan Ministry of Health, Labour and Welfare (MHLW) introduce a more efficient strategy to help mid-career and older workers in career choices. The Japanese government decided to use the terms “career consultation” and “career consultants” instead of “career counseling” and “career counselor” because of the ambiguity in concept of counseling. Aim of the consultation was to align the worker needs for career formation with enterprise requirements. Until 1990’s, Japanese human resource management system used to embody young people especially the fresh graduates on long-term employments and specific job skills of the new graduates was not a prerequisite for hiring. However, since 1990’s the labor market has dramatically changed. Companies have now reduced the hiring of fresh graduates on permanent long term basis and increased the non-regular part time employment and outsourcing. This shift in employment trend increased the youth unemployment rate by two folds in ten years [11-14]. In Japan, the “homeroom teacher” system has been adopted that requires class teachers to take up all aspects of guidance and counseling and they are the first line of defense in pastoral care work. National Administration Guidelines provides career guidance and education for all students and particularly emphasized on providing specific career guidance for those students who have been identified as being at a risk for leaving school unprepared for further education/training or workplace. In New Zealand, career education and guidance emphasize the need for students to develop career management competencies that includes: 1) Developing self-awareness, 2) Exploring opportunities and 3) Taking appropriate actions. The Role of School Counselors in Middle and High School in US, school counselors have the responsibility for providing counseling and guidance to the students regarding various aspects of academic and career related problems or decisions. Regarding career guidance, school counselors are required to provide basis for acquiring knowledge, attitudes and skills that will enable the students to make successful transitions into the labor market as well as from job to job across their career in life span. In the middle school, six to eight school counselors help students in career development through self-assessment activities, comparing middle school with high school and using assessment results. Students are expected to draw a relationship between interests and aptitudes and make a smart long-term career decisions. Thus, school counseling programs plays a pivotal role in preparing students to successfully transitions to the next level of education or joining workforce . Like other countries, Vietnam has established the career guidance program in educational system, with the direction from Government: “Promoting divide into different ways for postsecondary in education; paying attention in career orientation in high school". "Ensuring for secondary students commonly has enough knowledge platforms to meet the requirements following strong high school or vocational education; High schools graduates have access to vocational and prepare for quality higher education”. However, in the implementing process, there are many challenges to improve career guidance affair in Vietnam. In 2006, the Vietnamese Ministry of Education established the career guidance curriculum at grade 9 in Secondary school. Following that, students study of career development 3 periods per month, equal to 1 credit course per year. However, from much complain of teachers about the heavy programs with many subjects, the career guidance curriculum decreased to 1 period per month in 2008, accounted for half credit per year while at least is one credit course in another countries . As far the shorter duration of career guidance, it can be adjusted with other subjects and another services outside school. However, the assessment of career guidance in Vietnam lack validity and reliability researches, and normally met with some arguments by leaders, like as “career guidance in Vietnam has not been adequate attention, the effectiveness of career guidance in both schools and vocational education in universities is low, failing to meet the objectives”. According to some researchers, career guidance in secondary in Vietnam has not caught up with the present labor market and modern society. The objectives, contents, methods and forms of career guidance have not timely renewed the request modern economy – society. With some evidences from the career guidance in secondary schools, rate those students who are encouraged to study in vocational education is low, while almost 60% of the students in high schools fail the exam for enrollment to higher education. Besides that, 20% secondary school graduates go directly to labor market without any training for common work, like famers, doing garden, breed pigs and poultry [16-18]. Many of them get embarrassed before the actual working life, schools do not orient of career path for themselves. In Ireland’s secondary schools have one guidance counselor for every 500 students. Each is required to have a post-graduate diploma in guidance in addition to a teaching qualification. While in Vietnam, career guidance counselors in secondary schools are picked up from the existing teaching staff for the career development of the students, thus imposing extra work on them . Lack of human resources for career guidance (quantity and quality) and material resources in career guidance is the common phenomenon in most of schools in Vietnam. Career guidance staff has not been trained adequately like as professional or expert therefore they lack of knowledge and skills as well as experiences in career guidance process. Moreover, they are working load with a lesson in class with complex requirement while career guidance considered as additional work and invalid when comparing with teaching in class. In a workshop of career guidance in Hochiminh city, a summaries of causes for ineffective is the lack of knowledge, skills and experiences, most of the teachers encourage their student to continue their study at high schools and were found to pay less attention to vocational or technical schools, hence students usually make career decisions which are not based on their personality, interests, skills and value.. Another weakness is that the school managers have low incentive and motivation for both teachers and students almost no Career Guidance takes place at Lower School Education and only a few activities have been done at Upper School Education [19,20]. In Vietnam, economic transformation has made labor as indispensable criteria for raising living standard of the citizen. As claimed by the National Target Program that for the improvement and development of the new rural areas by 2020, the government has to pay attention to certain quarters such as the content for the development of production, increase of income of rural population and alleviation of poverty. This should be linked to the execution of the agricultural policy geared towards higher valueadded and sustainable development in the province [21-24]. Researches, transfer of science and technology being the top priority together with the applicable agriculture model building high-tech, and advanced techniques improving the quality of agricultural production; Especially, upgrading new rural areas must be linked to restructuring of the industry; Construction of industrial support for agriculture, and rural areas, especially the processing industry, manufacturing agricultural machinery, performing electrification, mechanization of agriculture and the introduction of small and medium countryside mount to rearrange agricultural labor ". This move transformed the value-oriented profession and career choices of students which requires renovation of vocational education to suit the new context. The high influx of immigrants from rural areas to cities in Vietnam leads to a number of social and economic problems such as weakening the fiber of social economic development, increase of population in the cities which will require more facilities and improvement. In addition, it can also contribute to other problems such as traffic congesting, employment issue, emergence of social evils and overcrowding the schools in the cities. Hence, career guidance in rural areas needs to improve the value of career guidance, by providing or introducing trends of economic development through Vietnamese government and also to attract foreign companies to invest in the rural areas of Vietnam where rich human resources are available at quite a reasonable low price or rate. Thus encouraging students’ interest in vocational education, especially, technical career will help them adapt to the labor capacities in social technology, and also to increase the number of this group to adequately provide labor resources for investing companies. Simultaneously, continuing the development of traditional careers in rural areas is also essential as it will boost high quality export of unique products abroad and ensure conservation of rich culture of Vietnam. And most importantly, it will enhance the living standard of rural citizens [25,26]. Career guidance has been existed in schools for a long time with the main goals of assisting students to reflect on their ambitions, interests, qualifications and abilities. It helps them to understand the labor-market and education systems, and to relate this to their needs in life and to become responsible global citizen. Comprehensive career guidance tries to teach student to plan and make their decisions about work and learning, and how to manage their career skills as well as career development. Career guidance provides information about the labor-market and about educational opportunities and more accessible by organizing it, systematizing it, and making it available when and where people need it. In some countries career guidance program is organized well by having high quality staff who have been trained and have rich experience, however, in case of Vietnam, it happens to be poor in quality, for Vietnam is a developing country in the Southeast Asia. Finding multiple solutions to improve quality of career guidance in Vietnamese schools, and implementing it, will offer access to good life for individuals and also provide for a sustainable development for the whole country. Bysshe S, et al. The economic benefits of career guidance: a review of current evidence. Centre for Guidance Studies, University of Derby. 2002. Watts AG. Careers education in higher education: principles and practice. British Journal of Guidance and Counseling. 1977;5:167-184. Orndorff RM, et al. A comparative study of declared and undeclared college students on career uncertainty and involvement in career development activities. Journal of Counseling and Development. 1996;74:632. Killeen J, et al. The economic value of careers guidance (No. 702). London: Policy Studies Institute.1992. Collin A and Watts AG. The death and transfiguration of career–and of career guidance? British journal of Guidance and Counseling. 1996;24:385-398. Fowkes KM and McWhirter EH. Evaluation of computer-assisted career guidance in middle and secondary education settings: Status, obstacles, and suggestions. Journal of Career Assessment. 2007;15:388-400. Gazier B. Transitional labour markets: from positive analysis to policy proposals. The Dynamics of Full Employment–Social Integration through Transitional Labour Markets, Cheltenham, UK: Edward Elgar. 2002;196-232. Feller RW. Aligning school counseling, the changing workplace and career development assumptions. Professional School Counseling. 2003;9:262-271. Ho YF. Reflections on school career education in Hong Kong: Responses to Norman C. Gysbers, Darryl TakizoYagi, and Sang Min Lee &Eunjoo Yang. Asian Journal of Counseling. 2008;15:183-206. HuiCDW. Teacher stress and guidance work in Hong Kong secondary school teachers. British Journal of Guidance and Counselling. 1996;24:199-211. Jarvis PSandKeeley ES. From vocational decision making to career building: Blueprint, real games, and school counseling. Professional School Counseling. 2003;6:244-250. Lapan RT, et al. The impact of more fully implemented guidance programs on the school experiences of high school students: A statewide evaluation study. Journal of Counseling & Development. 1997;75:292-302. Loh SY, et al. Occupational Pressure–Targeting Organizational Factors to Ameliorate Occupational Dysfunction. Journal of occupational rehabilitation. 2011;21:493-500. Mariño RJ, et al. Sociodemographic backgrounds and career decisions of Australian and New Zealand dental students. Journal of Dental Education. 2006;70:169-178. Nguyen Ha. 174 thousand undergraduates are unemployment. 2014. Nguyen TC. Bring career guidance to Vietnam’s secondary school, presentation in VVOB workshop. 2013. OthmanAHand AbooBSB. Guidance, counseling and counselor education in Malaysia. Counseling in the Asia-Pacific region. 1993;2:1-25. Perry JC, et al. School engagement as a mediator of academic performance among urban youth: The role of career preparation, parental career support, and teacher support. The Counseling Psychologist. 2010;38:269-295. Tran TT. Career guidance through vocational education in school.2013. 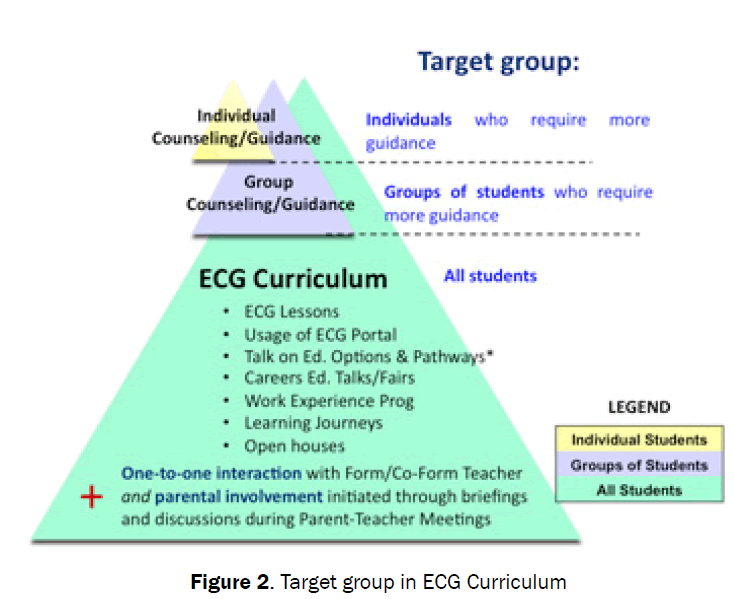 Vũ ĐC, et al.Innovation of career guidance in school. Vietnamese Educational Ministry. 2013. Vu T. 162 thousand undergraduates are unemployment. Vu TA. Unemployment causes of mistakes in career decision. 2014. Casserly M. The 10 skills that will get you hired. 2012. Watts AG. Careers education in higher education: principles and practice. British Journal of Guidance and Counseling.1977;5:167-184. Watanabe AM,et al. A perspective on career counseling in Japan. Asian Journal of Counseling. 2009;16:171-191.